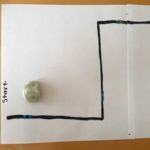 Coding with Ozobot 100cm Dash (5-7 year olds) | Imagine That! Class Description: This class has been modified for younger students 5-7 years of age. Students will measure 100 centimeters with a measuring tape or rulers. The course should mostly be straight. If there are turns they should be at a right-angle so that students can measure the distance of their race course. o They must be speed codes or cool moves. However, no code may be reused.